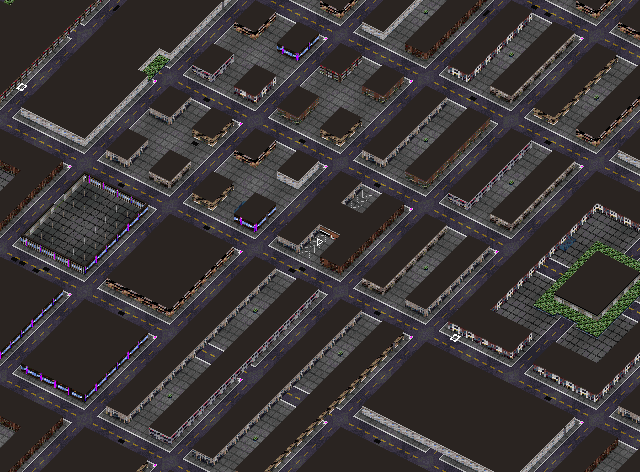 I am working to add more variety and detail to the map generator. In addition to geometry updates, the floor textures (which are fully procedurally generated) now differentiate the road and city block areas with a new concrete sidewalk pattern and distinct palettes, where previously everything was tarmac. 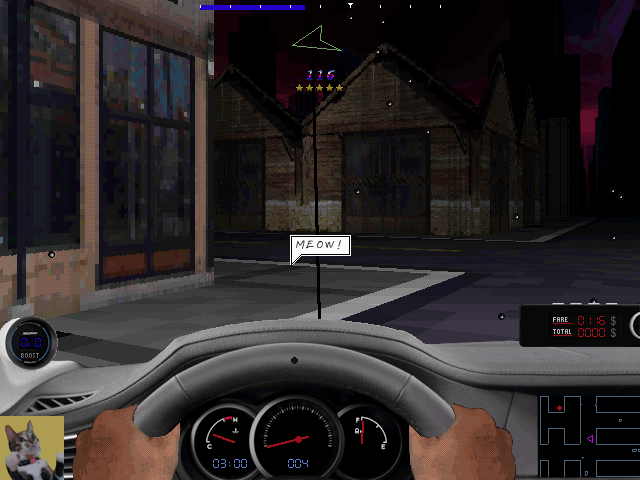 Previously the player would spawn on the side of the road besides a random building. Now the spawn point is an actual garage building with a driveway, and it features a unique texture. As some of you may know, the Career game mode features a garage menu where you can work on repairs and upgrades for your car. Now this garage building serves the purpose of being an actual place you can drive to, where previously you would just press ESC anytime to go back to the garage. You can still jump straight to the garage by double-pressing ESC, but that will cost you a $50 tow fee. Fuel consumption is also a new gameplay mechanic for the Career mode. No longer do you have a 10 minute timer for sessions, you can drive for as long as you have fuel. The tank usually lasts for about 8 minutes, but you can go for longer if you lay off the throttle. When the tank is nearing empty, a new warning light will flash on the dashboard to tell you to come back to the garage and refuel. Risk running out of gas and you will need to pay the tow fee. Also you need to make enough money to refuel; being short on cash or spending it all on upgrades can leave you stranded in the garage. 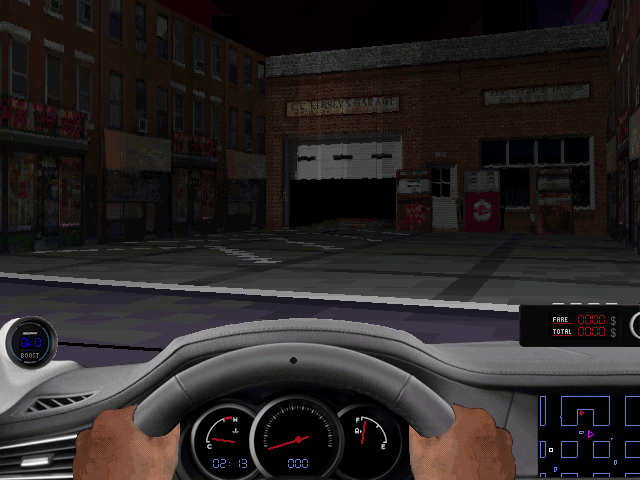 Timing has also been adjusted on the Arcade mode, which now starts on a shorter time -- 3 minutes instead of 4 -- but gives you extra time whenever you pick up or drop off a passenger, just like Crazy Taxi. Fuel simulation is also present but doesn't come into play since the timer will always run out before gas. 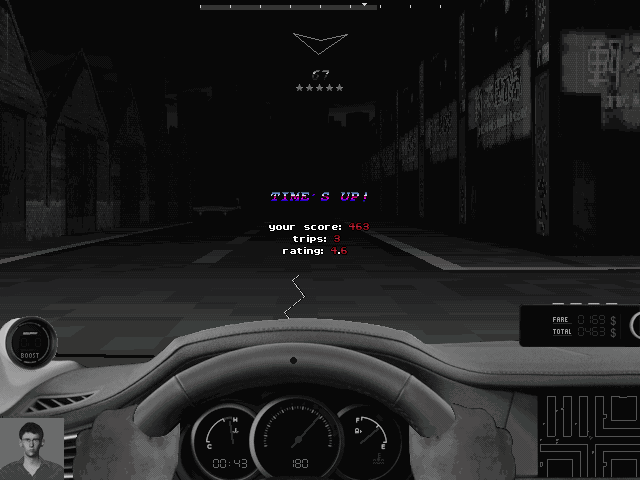 Another gameplay mechanic that can change the way you drive is the addition of passenger ratings. You will start every fare with a 5-star rating and lose a star whenever you annoy your customers, which can be done by crashing, driving too fast or too slow. Each passenger will have a preference; some might be in a hurry while others are scared of you racing like a maniac. This is something you may learn to balance in the Arcade mode: while driving slowly costs you time, each star you keep at the end of a ride will earn you 5 extra seconds back. Either way, having a perfect 5-star run is a new added challenge. Finally, here's an idea for a new character! I was goofing around with converting a picture of my cat to the VGA palette and thought it worked pretty well. I love oldschool image digitizing in games, if I could I'd have all characters taken from live-action photo shoots. Stunts is one of my favorite games that pulled this trick; I still don't know who those actors were! Maybe random programmers and artists.